GRP Valleys provide a robust, durable and lightweight alternative to lead and zinc valleys. The GRP Valleys must be laid on valley boards either cut between the valley rafters or a boarding 6mm thick overlaid on top of the valley rafters. Lay 19mm support board cut between rafters and supported on 38 x 25mm noggins nailed to rafters. Top surface of support board must be flush with top of trussed rafter. Alternatively a 6mm plywood board may be installed on top of the rafters. Position the valley battens along either side of valley. Lay underlay to main roof tiles as normal to finish on top of valley battens. Abut tiling battens to valley on top of the support boards and fix into position. Lay valley trough, allowing overlap at joints cut to suit at ridge and eave. Using clout headed nails, nail to valley battens through 8mm drilled holes, at approximately 1 metre intervals. 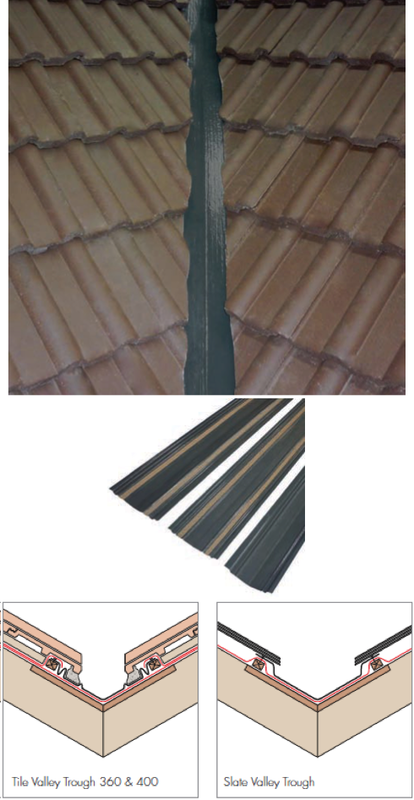 Lay roof tiles up to valley and cut to rake, various gaps between cut tiles to form open channel, dependent on pitch. Bed tiles with mortar to valley trough sanded strips, ensuring water channels are clear and interlocks are not blocked. For Slate Valley, as above, except that slates do not need to be bedded with mortar, but can be laid ‘dry’.